Let’s dive into a little workplace safety tangent. Earlier this month an article came out of Wyoming pointing that their state legislators may hike the workplace safety penalties for companies found to be in violation of the state’s Occupational Health and Safety Act. Currently, according to an OSHA.gov publication, OSHA can assess a penalty of $1,500 to $7,000 for a ‘serious violation’. The OSHA definition of a serious violation is one where there is substantial probability that death or serious physical harm could result. This could be a situation that the employer was not even aware failed to meet federal safety standards. We come across this all the time when it comes to fall protection and machine guarding. If your roof hatch is open and employees are doing work in the vicinity, there is an opportunity for serious injury unless you use a roof hatch safety rail. Likewise, fixed ladders that do not have automatically closing ladder gates or offset orientations could also cause serious injury should a fall occur. Shop machines without proper guarding, and in some cases, without electrical interlocks, can also cause serious violations if your employees can gain access to movable parts without the machine shutting down. OSHA also has a penalty for a “Willful Violation”. This they define as a violation that the employer intentionally and knowingly commits. The employer is aware that a hazardous condition exists, knows that the condition violates a standard or other obligation of the act, and makes no reasonable effort to eliminate it. OSHA can access penalties up to $70,000 for each violation. Knowing that areas lack proper fall protection but choosing not to address the hazard could easily put an employer into this category of violation. Should that violation result in the death of an employee the penalty can be increased up to $250,000 (or $500,000 if the employer is a corporation). Those fines are in addition to any legal amounts the injured or killed party may be awarded. As Benjamin Franklin once put it, “An ounce of prevention is worth a pound of cure”. Proper safety equipment is MUCH less expensive than ignoring a safety issue and having a costly accident. This entry was posted in Uncategorized on November 14, 2014 by Brett. 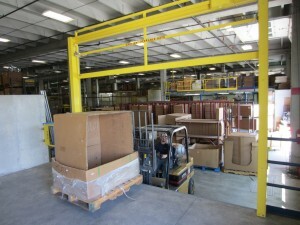 Recently, the vertical lifting mezzanine gate received a redesign. I’d like to take a moment to go over some of the modifications made to better assist our customers. The most noticable change in the design was to how the gate moves along the columns. In the old design the gate traveled to approximately 6” from the top of the column. This would vary a bit depending on the size of the counterweight required. We most commonly used a 12’ tall column which would allow for approximately an 8’ clearance height under the raised gate. The gates operation has changed slightly. We now typically use a 10’ tall column and the gate now travels beyond the columns by 6” allowing for a 7’ clear height under the raised gate. As before, custom heights are still available, but by more efficiently utilizing our customers’ vertical space, the new vertical mezzanine gate is a great option in more locations. One of primary goals for the redesign was to improve the lead time. In the old design, every mezzanine gate was a custom unit. Each mezzanine gate would require its own set of drawings to be drafted, and would need to be made from scratch as the orders where approved. In the redesigned gate, many of the components where standardized. We are now able to provide our vertical mezzanine gate customers with their approval drawings typically in a day or two, and improved the overall production cycle as well to about 6 weeks on average. To further improve our lead times, we took two of our most requested sizes and began stocking many of the components. We can now typically ship out standard 6’ or 8’ clear width vertical mezzanine gates in powder coated mild steel in about 3 weeks on average. Our vertical mezzanine gates have always been available in manual, electric, pneumatic with electric controls, or fully pneumatic for explosive environments. From time to time we receive calls from customers who previously purchased a manual mezzanine gate and wanting to upgrade it to an automated unit. Unfortunately with the old design there was no easy way to convert it, and the customers would need to replace the gate. With the redesigned vertical mezzanine gate, a customer can purchase a manual gate, and in the future if they are looking to upgrade it purchase a kit to easily convert their existing gate in the field. When the factory built their prototype, it only took them 15 minutes to convert a manual vertical mezzanine gate into an electric gate. 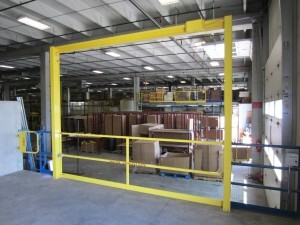 We’re really pleased with how the redesigned vertical mezzanine gate turned out. The changes in the design have made a marked improvement in the lead times while not just maintaining its adaptability, but improving it. This entry was posted in mezzanine gates, Safety Gates on November 13, 2014 by Derick.